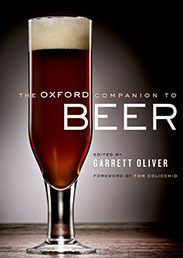 In this blog post, Garrett Oliver, the author of The Oxford Companion to Beer, recommends kosher beers to compliment your Hanukkah dinners. I always knew that my family was a little different, but it wasn’t until my mid-teens that I realized exactly how weird we were. An African-American family living in the suburban greenery of Hollis, Queens, at the outskirts of New York City, we thought little of the fact that my father’s big hobby was hunting game birds. With dogs, no less. Often on horseback. Around the holidays, my Aunt Emma made wonderful chopped liver, and in the springtime, our table was often festooned with matzoh bread. It never occurred to us that these last two items were Jewish food traditions that rarely made forays into our community, and to this day, none of us are sure how they got there. In a way, I think that this sort of culinary experience is at the heart of being an American, and as I travel the world, it’s one of the things that makes me proud of this country. As I prepare for Hanukkah celebrations with friends, I’m glad to say that beer is very much at the heart of the holiday meals. Some of my friends keep kosher, and many do not, but thankfully most beers are considered “kosher by default” in most parts of the world. Jewish dietary laws, kashrut, is interpreted by local councils of rabbis. In the United States, Canada and Israel, some people only eat foods that are specifically certified as kosher by rabbis, especially around Passover. At my brewery, we actually have some of our beers certified kosher for Passover, and a rabbi comes and blesses the beer! Unless your own diet is very strict, there are very few beers that would ever cross your table that are off-limits, so you can tuck right into your holiday beer pairings. It’s nice to start off the meal with light, spritzy saisons, the farmhouse ales of Belgium. They’re dry and lively, and often show appetizing peppery and lemony aromatics. Re-fermentation in the bottle gives them a Champagne-like carbonation and texture, which is one reason why we often drink them out of Champagne flutes. Full-flavored beers can work wonders with the classics on the table, especially beef brisket and latkes. Both of these dishes are fatty, a little salty, and typified by caramelized flavors (no wonder we love them! ), and beers with caramel and roasted flavors work well here. British and American brown ales are a good place to start, bringing light chocolate, caramel and coffee flavors that harmonize with everything, even sautéed Brussels sprouts. If you want something more complex, go for dark Trappist and abbey ales, where the dark color and caramel flavors come from highly caramelized sugars rather than grains. This translates into dried fruit and raisin-like flavors, along with rum-like flavors that remind me of Cracker Jacks or the burnt surface of a crème brulee. When it’s time for dessert, beer really does outshine all other beverages. My favorite dessert beer style is imperial stout, a strong dark beer originally made for Catherine the Great. Brewed with large amounts of malts that have been roasted as dark as espresso coffee beans, imperial stouts taste like dark chocolate, coffee and dark fruit, making them a perfect foil for a range of desserts. With chocolate desserts, they play harmony, rowing in with similar flavors. With pastries such as rugelach, the coffee-like character is perfect, and the beer has just enough sweetness to match without becoming cloying. And these beers are a wonder with ice cream too — many people enjoy making ice cream floats with imperial stouts. Just make sure to have a soft-drink version ready for the kids! The great thing about serving and bringing beer to the holiday table is that it’s fun. Everyone’s had one at some point or another, and though wine is great and has a wide range of flavor, it rarely surprises people. Beer, however, can be very surprising, because it can tastes like almost anything, from lemons and bananas to chocolate and coffee. Some friends and family might even leave your holiday table having discovered something brand new to like, and wouldn’t that be cool? This time of year I can’t help wishing that my Aunt Emma was still here; I’ll bet that Belgian abbey ales would have been great with her chopped liver, but I never learned how to make it. So among the other things you do this Hanukkah, teach the kids how to make your latkes! Though I’ll bet they’re not quite as good as mine. Featured Image credit: Glass of IPA by mnm.all. Public Domain via Unsplash. I don’t see how it is possible for beer to be kosher for Passover – malted barley is forbidden. It’s a bit off to the thrust of this article, but rabbis don’t bless anything. They certify that the ingredients are kosher and the procedures follow the laws of kashrut. Your comment about the variety of beer tastes in right on! Founders Breakfast Stout is the best cup of coffee I have ever had. As I write this I am drinking a local craft beer, Good People’s Pale Ale!